Gay rights activists hold up a large rainbow flag and a banner reading "This is the Pride" during a protest in Belgrade, Serbia, Friday, Sept. 27, 2013. About a hundred gay pride activists marched past the downtown Serbian government headquarters late Friday to protest a ban on a gay pride march for a third consecutive year because of threats made by right-wing groups. BELGRADE, Serbia — European Union officials have criticized the Serbian government’s decision to ban a gay pride march for the third consecutive year because of threats from right-wing groups. EU’s Enlargement Commissioner Stefan Fule described the move Saturday as a “missed opportunity to show respect for fundamental rights” at a time when Serbia seeks to open entry talks with the bloc. 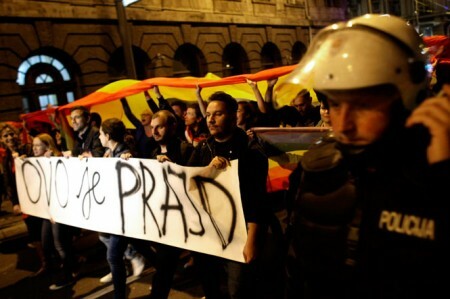 Gay rights activists hold up a large rainbow flag and a banner reading “This is the Pride” during a protest in Belgrade, Serbia, Friday, Sept. 27, 2013. About a hundred gay pride activists marched past the downtown Serbian government headquarters late Friday to protest a ban on a gay pride march for a third consecutive year because of threats made by right-wing groups. Serbia’s authorities have expressed fear that the event Saturday could lead to a repeat of violence from 2010, when a pride celebration erupted in daylong clashes between police and extremists.